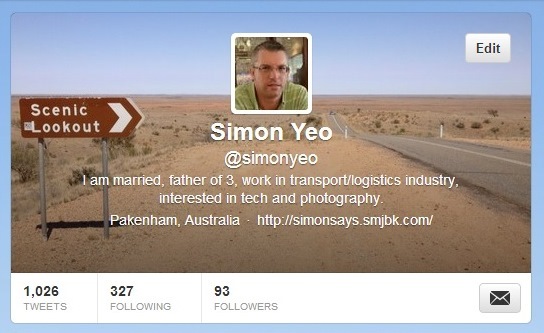 Today has been my biggest day on Twitter since I joined several years ago. Including re-tweets, I tweeted 43 times today. My topics varied from the passing of cricket legend Tony Greig, interacting with a guest on ABC News24, a very healthy "discussion" on the safety of B-Triple trucks, photography re-tweets and linking to a YouTube video of my kids. All these tweets today took my total number over 1000, but I still call myself only a casual user of Social Media. Twitter are slowly rolling out the ability to view all of your twitter history. When it's available to me, I'll be really interested to look back at what I posted in my early days.